Windsor (ON): There was a time when people who bought trucks used them strictly for work purposes. You either had to haul something on a regular basis, or you worked in the outdoors where the truck bed was a necessity. 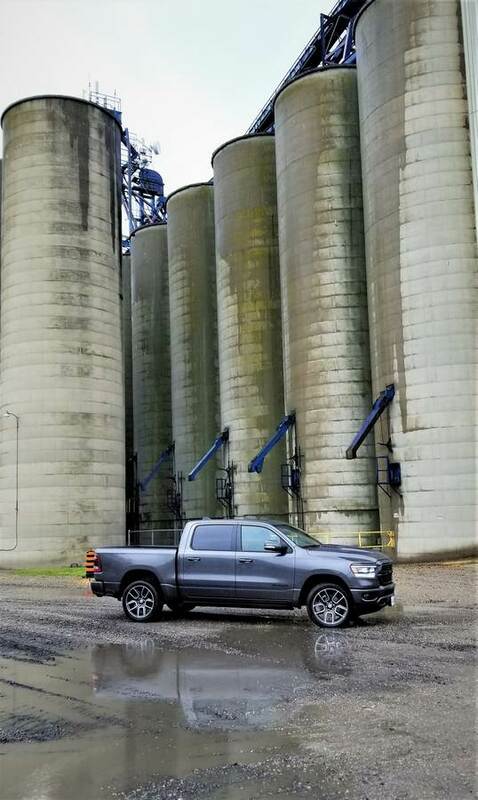 Over time, more and more luxuries began to be added to these “work” trucks; things like power windows and door locks, better audio systems, smoother suspension systems and now, even panoramic sunroofs. 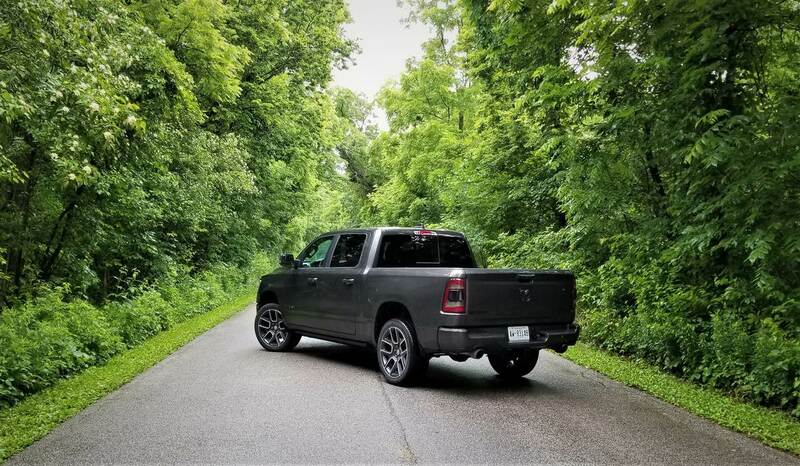 It’s safe to say that today, trucks appeal to buyers more than ever. And numbers prove this. 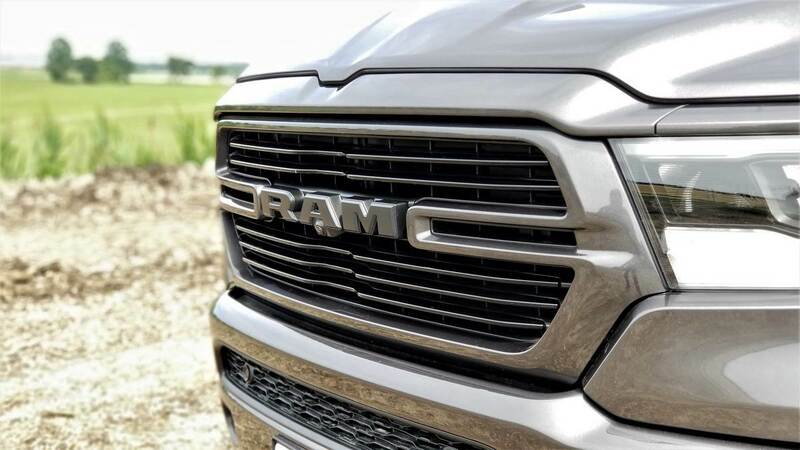 A few years ago, the RAM trucks began selling so well that Dodge decided to brand them separately. How well are they selling? 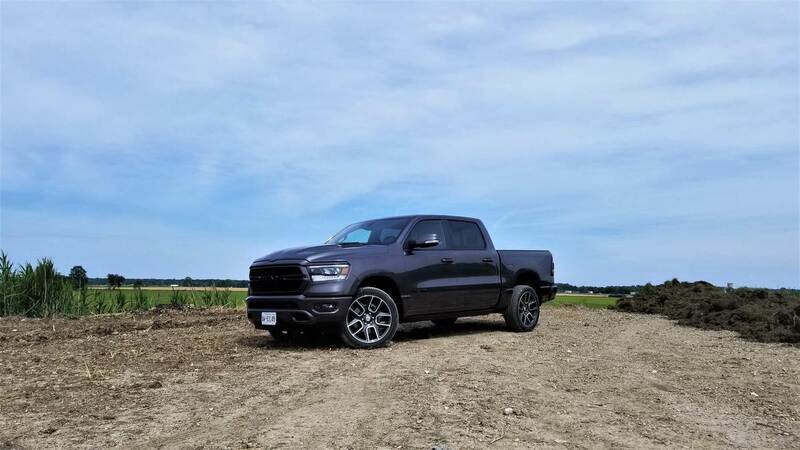 Well, the RAM brand accounts for almost 40% of all Fiat Chrylser Automobiles (FCA) sales in Canada. So, if they’re selling this good, then the RAM must be pretty darn impressive. 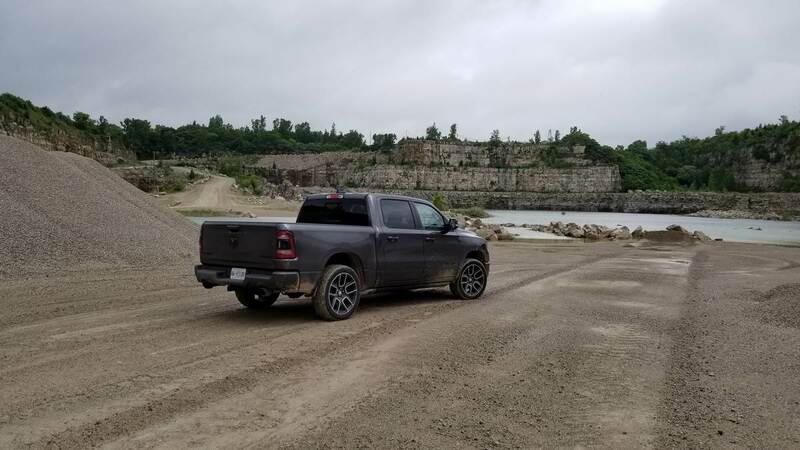 To test the new 2019 RAM 1500 Sport, we were invited to Windsor, Ontario to put it through its paces. 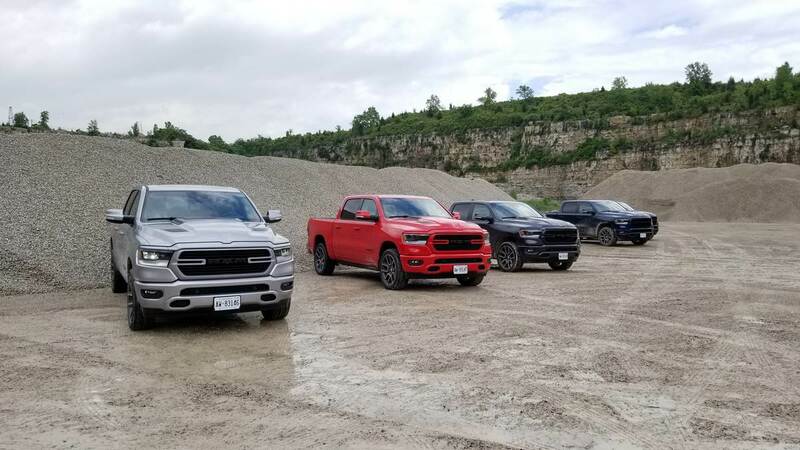 From a purely subjective perspective, I find the new RAM 1500 to be the best looking of the bunch. Compared to last year, the front end has been completely redesigned to not only be more streamlined, but “sharper”. Last year’s look was bulkier. The new look is more handsome and on the top trims, more luxurious. The body has been stretched by 4” and trust me, you can really tell. The rear doors are now two inches longer and are almost the same length as the fronts. 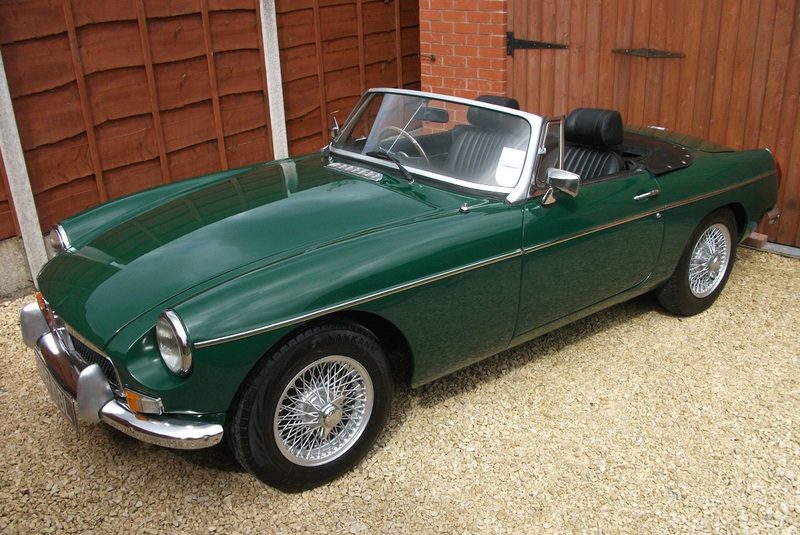 Not that getting into and out of the rear seats was ever a problem, but now it’s even easier. 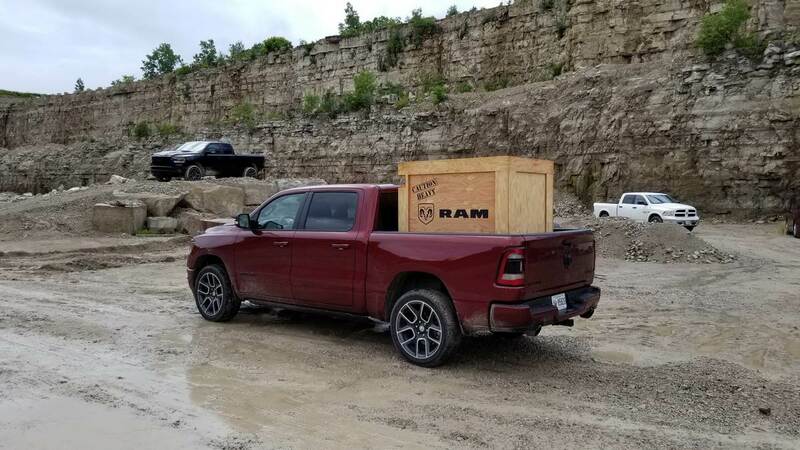 Even though the new RAM is longer, it went on a strict diet of high strength steel and aluminum to shed off more than 225 pounds, all the while building more strength. 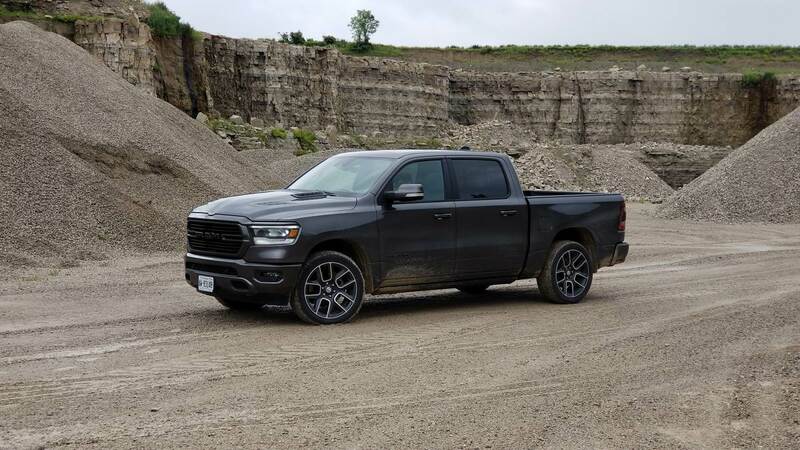 Last year’s model had only an aluminum hood, whereas the new RAM adds aluminum to the tailgate and some mounting and suspension components. To make sure that the truck was more streamlined, there’s an active air dam that deploys depending on speed, reducing the coefficient of drag even further. That’s pretty impressive for a truck! 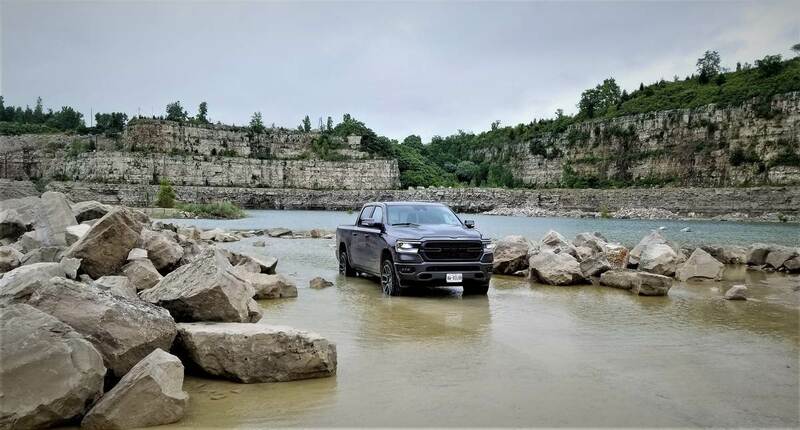 One of the best features of the new RAM has to be its class-exclusive Active-Level four-corner air suspension system, which we’ve seen in the Grand Cherokee. 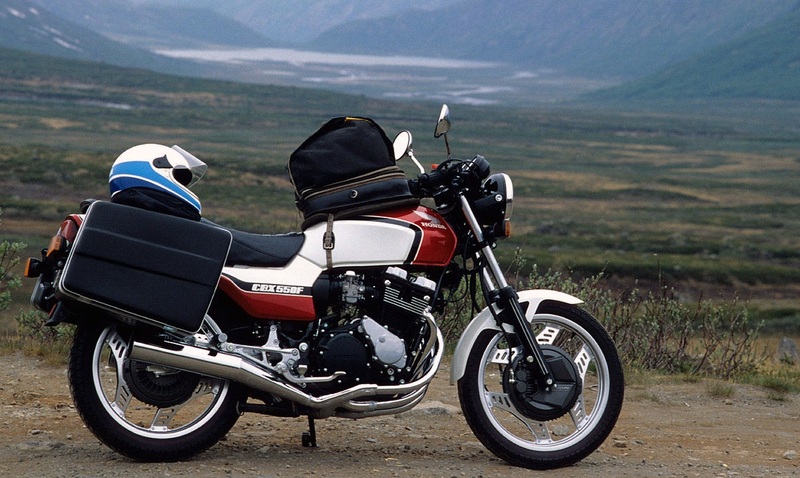 The system has five modes – Normal, Aero, Off-Road 1, Off-Road 2, and Exit/Entry – all of which can be selected, but are overridden automatically depending on speed. The air suspension has a total play of 102 mm, all of which are totally useful in every day situations. 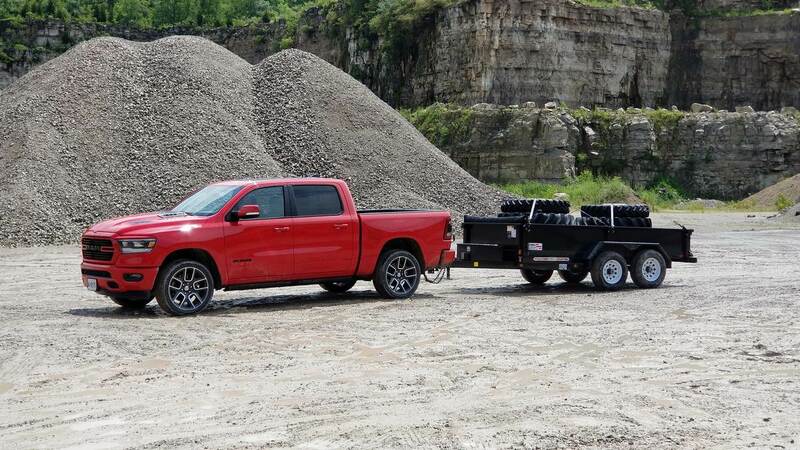 In fact, during a demonstration, one of the FCA engineers showed how easy it was to hitch up to a trailer by lowering the truck to its lowest point, backing up to the hitch ball, and then raising it. 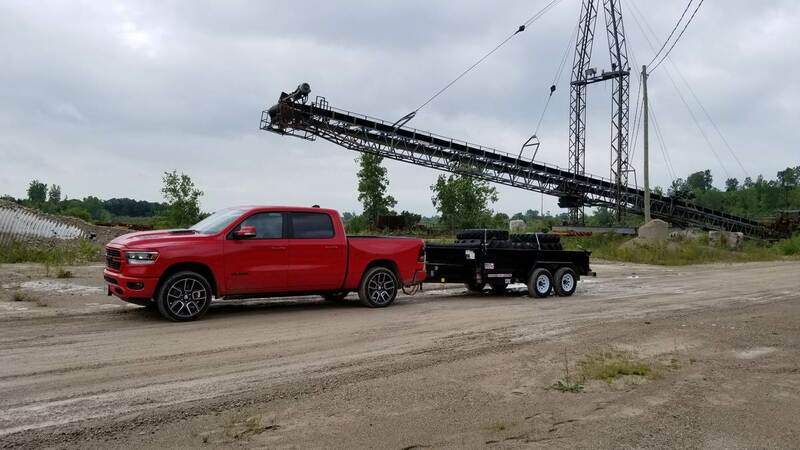 Rather than having to get in and out of the truck two or three times, it’s now possible to hitch up a trailer in one go. Try doing that before. Need to go to a fancy event? Well, you can, in this truck. All occupants can be surrounded by opulence usually reserved for automobiles. The modern and stylish interior includes leather, heated and cooled FRONT and REAR seats, storage compartments for large purses or laptops, and enough space to fit up to six professional football players. 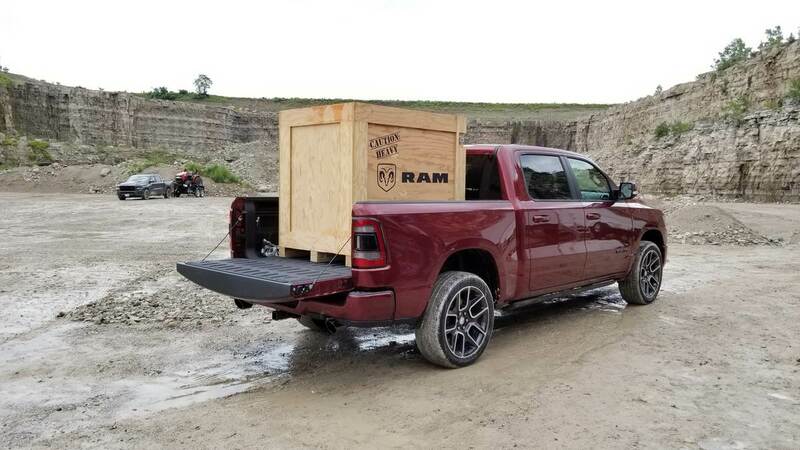 And if you still need more, FCA just upped the game with class exclusive reclining rear seats, something I always wished for in a truck. 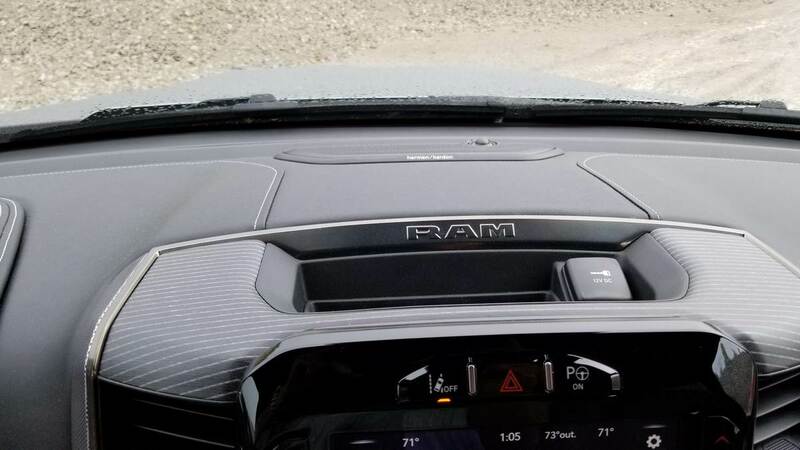 In terms of technology and the infotainment system, the new RAM has the competition beat, hands down. Available is the new 12” touchscreen, which is only surpassed by Tesla’s behemoth 17”. Unlike the Tesla, there’s still buttons that surround the screen to make life easier. 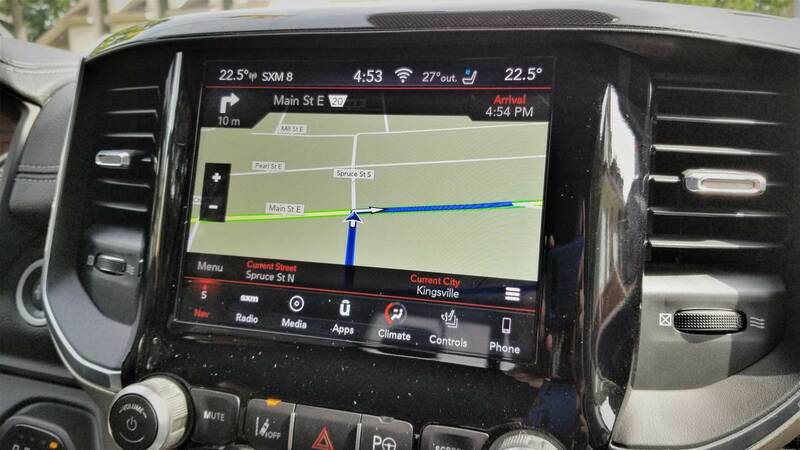 The new screen can be customized to suit each driver’s needs; as an example, you can run two apps on two separate split screens – say, navigation on one and satellite radio on the other. The new Uconnect system supports both Android Auto and Apple CarPlay. And how does it sound? Again, pretty impressive, even when driving at highways speeds. 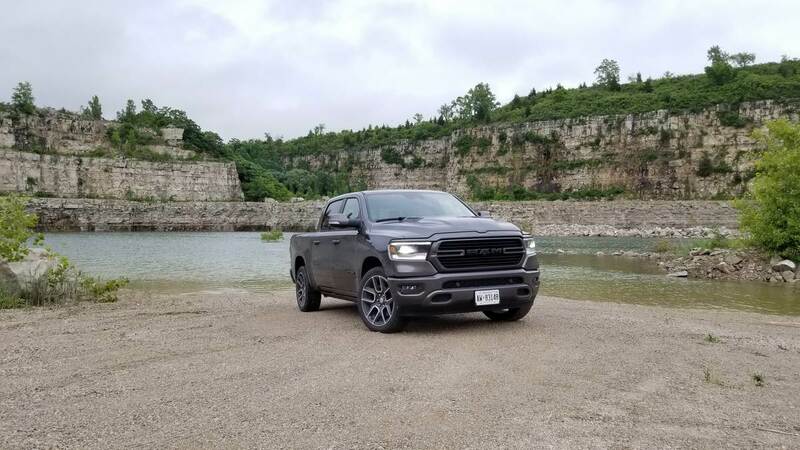 On the road, the new RAM is a pleasure to drive, because it’s more than just a truck – much more. 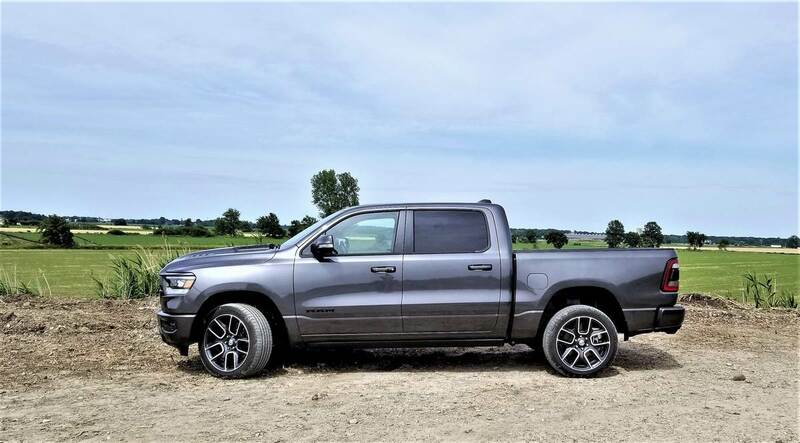 I’ve stated before that trucks nowadays have become luxury vehicles, and the RAM is the perfect example. The cabin is quiet – no, let me rephrase that. The cabin is ultra-quiet. My co-pilot and I couldn’t believe that even going 110 km/h, you could almost hear a pin drop. 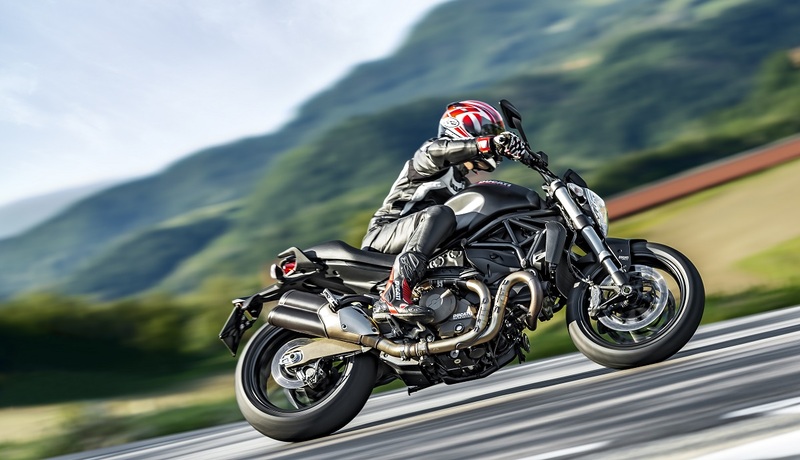 This is due to some pretty impressive technology, which includes tonnes of insulation, acoustic windshield and front glass, and active noise cancelling. 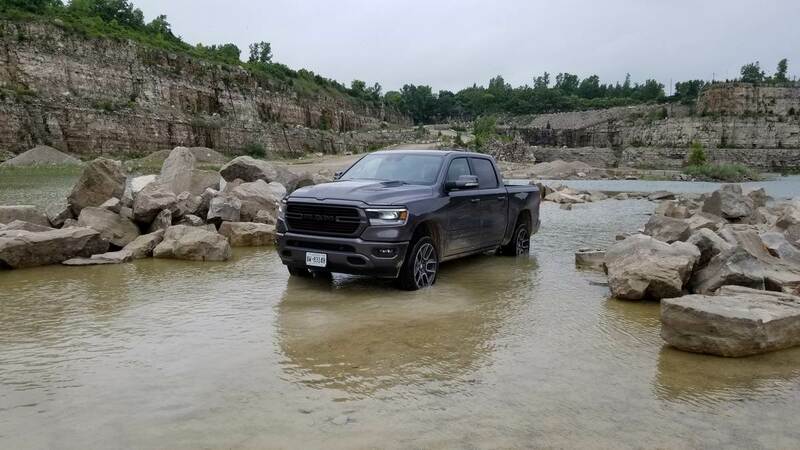 But that’s not all; to reduce noise even further, FCA utilized robotic sealing of joints, body hydro mounts that help reduce shake and even vibration damping units on the frame rails. FCA says the interior noise is around 66 decibels! 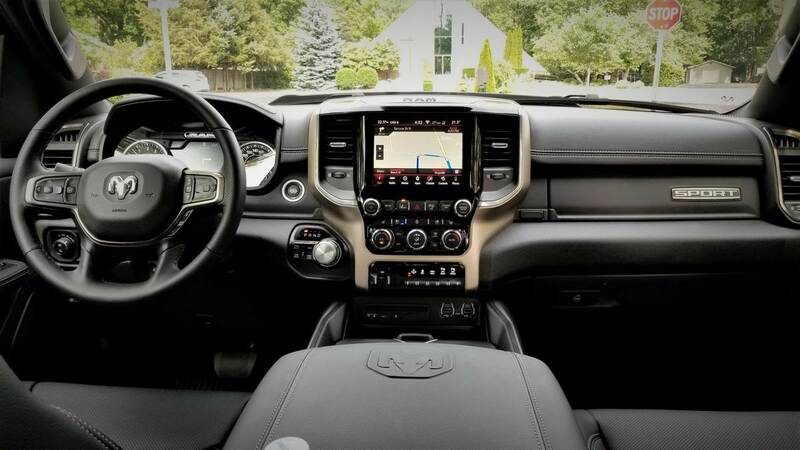 Now don’t let the quiet interior fool you of the brute power of the new RAM. We drove the 5.7L VVT V8, which has 395 HP and 410 lb.-ft. of torque. Although fuel efficiency numbers weren’t available yet, we’re positive that with cylinder deactivation, the numbers should be pretty good. Step on the gas and the truck lurches forward and puts a smile on your face. If you don’t need the V8, the 3.6L Pentastar V6 with eTorque mild-hybrid technology might be your cup of tea. It still puts out 305 HP and 269 lb.-ft. of torque. And diesel lovers, not to worry as the EcoDiesel will be available next year. You may have noticed the word eTorque in the previous paragraph and it needs some basic explanation. 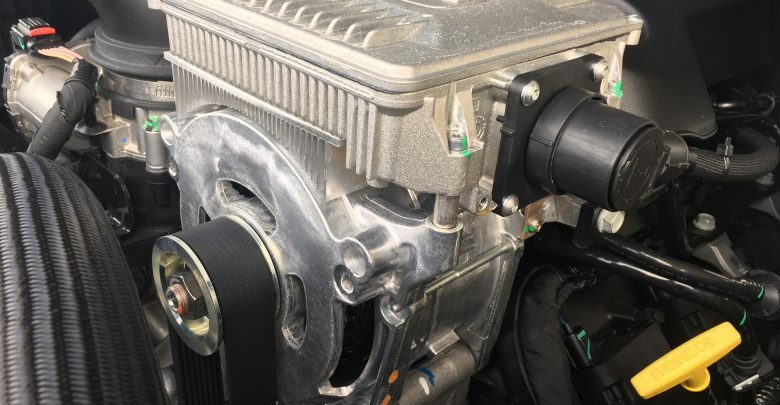 ETorque is a 48-volt electrical system that is able to store about 430 watt-hours of energy in a valise sized battery pack. 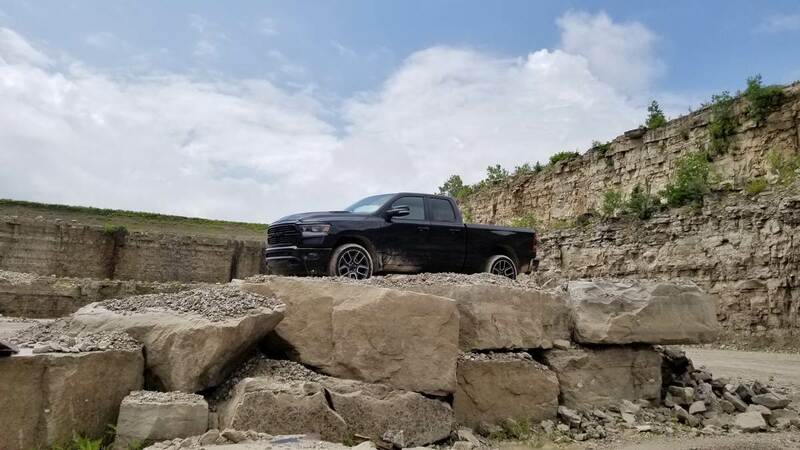 Although this system adds about 90 pounds to the truck, it also adds 90 lb-ft of torque to the Pentastar V6 and a whopping 130 lb-ft in the optional eTorque V8. 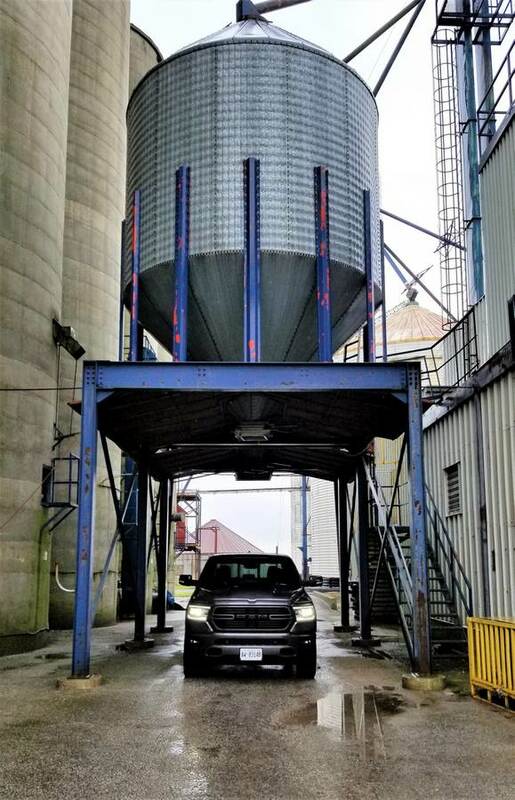 I can tell you that when you put your foot down, the truck really moves, and it’s noticeable. 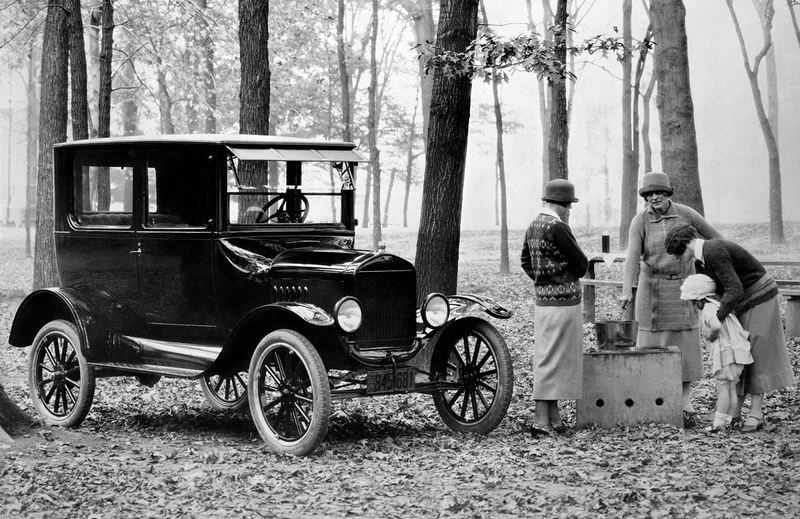 At the time of this event, pricing wasn’t available for the upgrade in the V8. 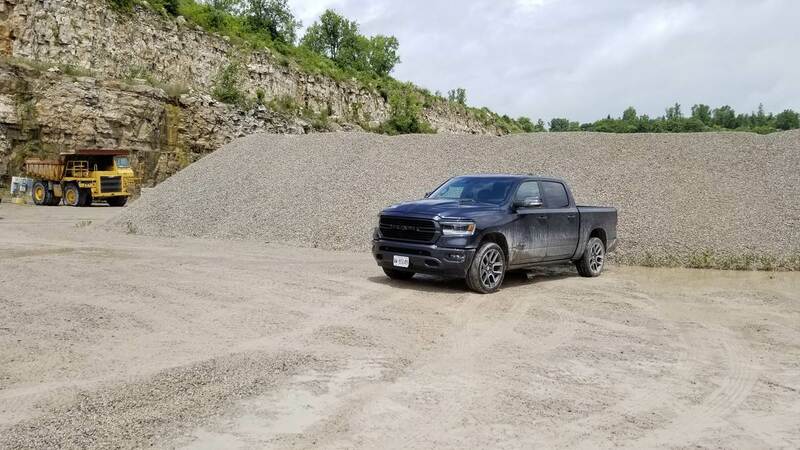 Whether it was on side streets, highways, or even in a quarry, the RAM 1500 is pretty impressive all-around. Steering is good and responsive (remember it’s a truck), shifting is smooth, and overall, the truck feels very planted. Hauling a heavy payload was a piece of cake as well, not because of the truck’s capability, but how easy it still was to drive. Now what about that Sport? 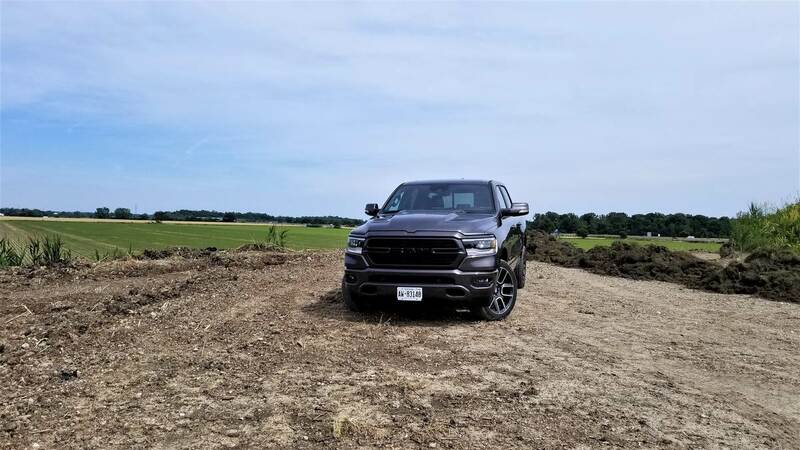 Well, for starters, it’s a truck built only for Canada, with a monochromatic exterior with all-black badging, body-colour grille, door handles, and mirrors, available 22” wheels and the unique Sport nameplate. On the inside, the Sport adds a satin-finish centre cluster and cloth/vinyl sport seats with unique “hex” mesh inserts. LED headlamps and fog lamps are now standard, as is the power-adjustable pedals, damped tailgate, rear-view camera, hill start assist, and push-button start. 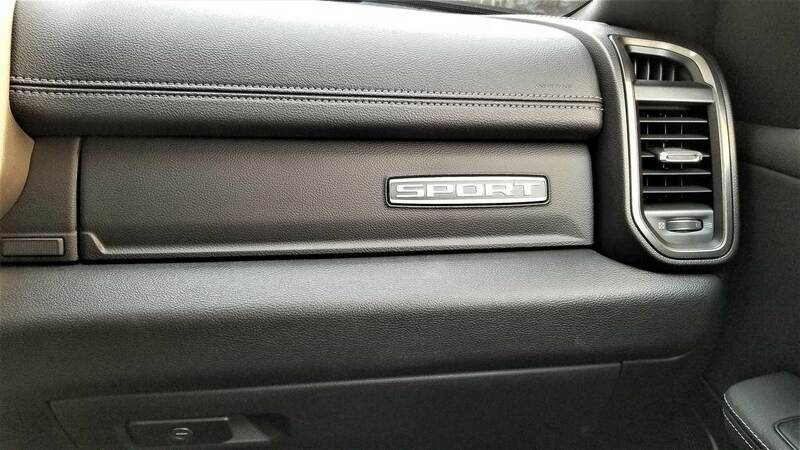 Of course, the Sport can be had with many additional optional packages. 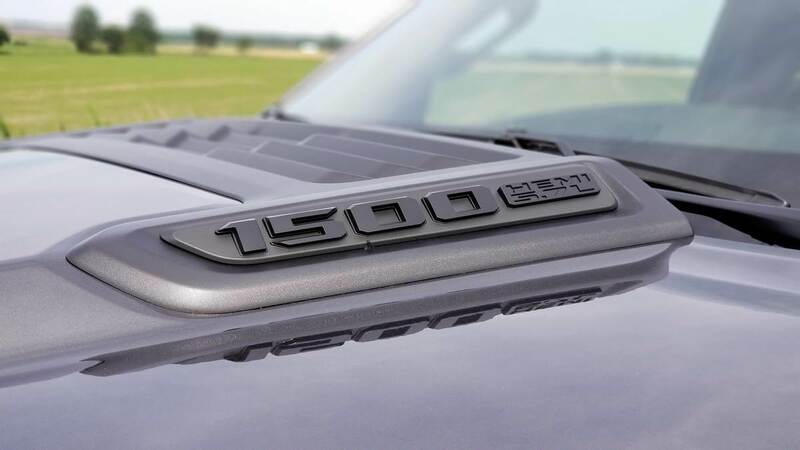 Honestly, I’ve said it before – the RAM 1500 itself is a great truck, and the Sport just adds more to it. 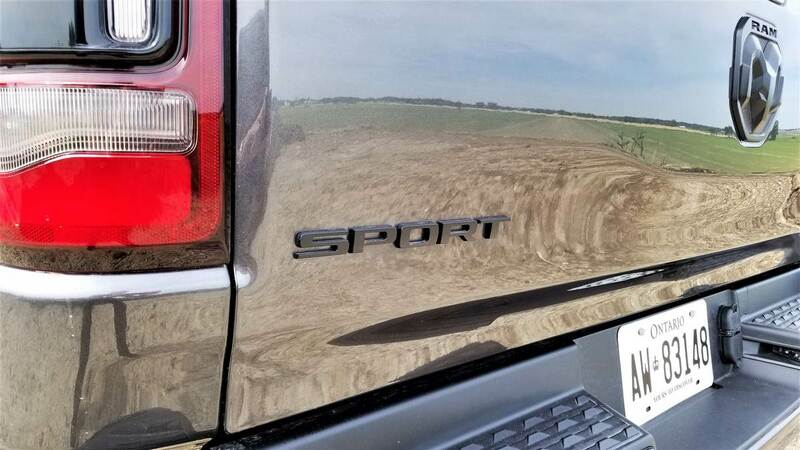 The 2019 RAM 1500 is one heck of a truck – it’s got everything you could need in a truck, but with more, so much more. Trust me, you need to check it out.